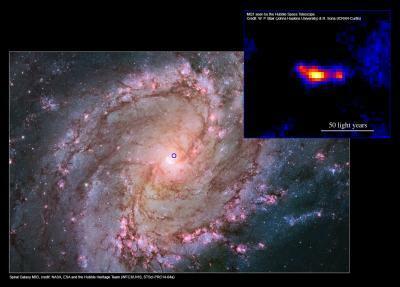 Astronomers studying nearby galaxy M83 have found a new super-powered small black hole, named MQ1. M83, the iconic Southern-sky galaxy, is being mapped with the Hubble Space and Magellan telescopes (detecting visible light), the Chandra X-ray Observatory (detecting light in X-ray frequencies), the Australia Telescope Compact Array and the Very Large Array (detecting radio waves). Astronomers have found a few compact objects that are as powerful as MQ1, but have not been able to work out the size of the black hole contained within them until now. The team observed the MQ1 system with multiple telescopes and discovered that it is a standard-sized small black hole, rather than a slightly bigger version that was hypothesized to account for all its power. "MQ1 is classed as a microquasar - a black hole surrounded by a bubble of hot gas, which is heated by two jets just outside the black hole, powerfully shooting out energy in opposite directions, acting like cosmic sandblasters pushing out on the surrounding gas," said Curtin University senior research fellow Dr. Roberto Soria, who is part of the International Centre for Radio Astronomy Research (ICRAR) and led the team investigating MQ1 . "The significance of the huge jet power measured for MQ1 goes beyond this particular galaxy: it helps astronomers understand and quantify the strong effect that black hole jets have on the surrounding gas, which gets heated and swept away. Nearby spiral galaxy M83 and the MQ1 system with jets, as seen by the Hubble Space Telescope. The blue circle marks the position of the MQ1 system in the galaxy (shown inset). Image s: M83 - NASA, ESA and the Hubble Heritage Team (WFC3/UVIS, STScI-PRC14-04a).MQ1 inset - W. P. Blair (Johns Hopkins University)&R. Soria (ICRAR-Curtin). "This must have been a significant factor in the early stages of galaxy evolution, 12 billion years ago, because we have evidence that powerful black holes like MQ1, which are rare today, were much more common at the time. "By studying microquasars such as MQ1, we get a glimpse of how the early universe evolved, how fast quasars grew and how much energy black holes provided to their environment. "As a comparison, the most powerful microquasar in our galaxy, known as SS433, is about 10 times less powerful than MQ1. Although the black hole in MQ1 is only about 100 kilometres wide, the MQ1 structure - as identified by the Hubble Space Telescope - is much bigger than our Solar System, as the jets around it extend about 20 light years from either side of the black hole. Black holes vary in size and are classed as either stellar mass (less than about 70 times the mass of our Sun) or supermassive (millions of times the mass of our Sun, like the giant black hole that is located in the middle of the Milky Way). MQ1 is a stellar mass black hole and was likely formed when a star died, collapsing to leave behind a compact mass. The discovery of MQ1 and its characteristics is just one of the results of the comprehensive study of galaxy M83, a collection of millions of stars located 15 million light years away from Earth.